WWE remains in the United Kingdom tonight, as Smackdown Live airs from London, England tonight. While live spoilers will be available before tonight’s episode airs, this is your spoiler-free preview for tonight’s Smackdown! Last week began the build to June’s Money in the Bank PPV, as two men and one woman qualified for their respective ladder matches. In just over a month, The Miz, Rusev, and Charlotte Flair will each compete for the Money in the Bank Briefcase, guaranteeing it’s holder a championship opportunity at any point they desire. While it’s still early in the builds, these look to be two of the most stacked MITB matches in recent years, and especially in Rusev’s case, it’s great to see hard work get rewarded. We also saw Mandy Rose defeat Becky Lynch, Cesaro defeat Xavier Woods, and hype vignettes for SAniTy and Andrade “Cien” Almas. It’s announced that Andrade “Cien” Almas and Zelina Vega will debut next week. El Idolo is finally here. After weeks of hype vignettes, Andrade “Cien” Almas is set to make his official WWE debut tonight. The former NXT Champion – along with his associate Zelina Vega is scheduled to appear for the first time on Smackdown Live tonight in London, England. While there’s no word on what the former La Sombra is set to do tonight, he seems set for big things; he’s easily one of the most talented wrestlers in the world, and since partnering with Vega has been one of the hottest acts in WWE. He was well received during his brief stint in January’s Royal Rumble; how will he be received in England? Will he enter himself into a Money in the Bank qualifier? Or, will someone appear to challenge the blue brand’s newcomer? Find out on tonight’s Smackdown! Neither AJ Styles nor Shinsuke Nakamura were cleared to compete last week after the game of Roshambo they played with each other at Backlash. However, the two rivals will face off not once more, but at least twice more as Nakamura looks to capture his first WWE Championship. Tonight, Styles and Nakamura will face off in London, with the winner getting to pick the stipulation for their match at Money in the Bank. Hopefully, we’re moving towards the conclusion of this feud; who ever thought that we’d say that about this pairing? Jeff Hardy, I believe, is still not allowed in the United Kingdom, so we may not see the United States Championship make an appearance tonight. He’s not mentioned in WWE’s official preview for tonight’s episode, so any developments on the U.S title will come as a surprise to this writer. 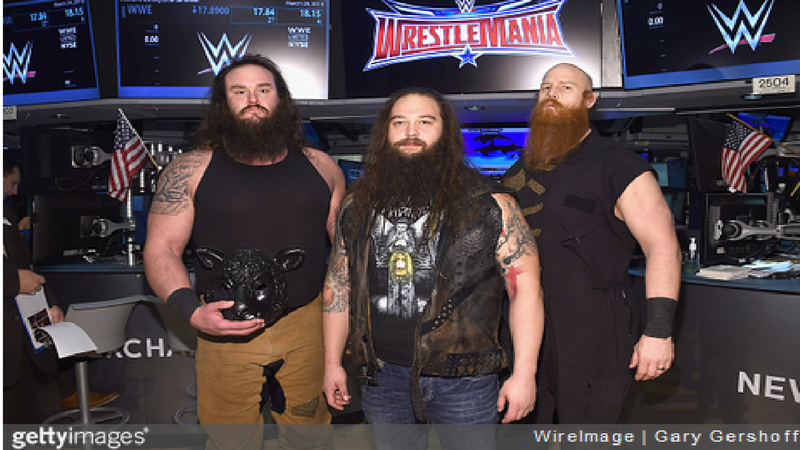 the Bludgeon Brothers; while I’m a fan of both Rowan & Harper, their tag team championship reign has been, well, boring. They still lack a challenger for their titles, and have been in a holding patter for the last number of weeks. Will we finally see new opponents emerge? Carmella is scheduled to host a Royal ‘Mellabration to celebrate her victory over Charlotte Flair at Backlash. With the Queen still in New York after her appearance for NBC yesterday, will a new challenger to Carmella’s throne emerge? The New Day will battle The Bar tonight in a Money in the Bank qualifying match, with one member of the winning team being entered in the Money in the Bank ladder match. My early bet is on Big E; who’s your pick? After his loss to the Roman Reigns at Backlash, Samoa Joe failed to appear on last week’s Smackdown. Same goes for Randall Keith Orton, and neither are announced for a segment tonight. Will either grace our screens? Happy Rusev Day!! After defeating Daniel Bryan last week, the Bulgarian Brute is officially headed to the Money in the Bank ladder match. How will Rusev, Aiden English and Lana respond? How will Bryan handle his first loss since returning? Tons of questions to be answered on tonight’s Smackdown, and only one way to find them out – by tuning in! You watching tonight? Let us know your thoughts on tonight’s episode and tweet us at @WCSportsCA, or in the comments below!